The Breaks of the Game (Paperback) | novel. More than 6 years after his death David Halberstam remains one of this country's most respected journalists and revered authorities on American life and history in the years since WWII. A Pulitzer Prize-winner for his ground-breaking reporting on the Vietnam War, Halberstam wrote more than 20 books, almost all of them bestsellers. His work has stood the test of time and has become the standard by which all journalists measure themselves. The New York Times bestseller, now with a new introduction! 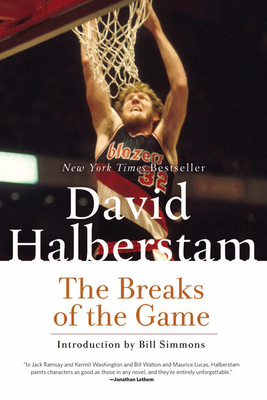 The Breaks of the Game focuses on one grim season (1979-80) in the life of the Bill Walton-led Portland Trail Blazers, a team that only three years before had been NBA champions. The tactile authenticity of Halberstam's knowledge of the basketball world is unrivaled. Yet he is writing here about far more than just basketball. This is a story about a place in our society where power, money, and talent collide and sometimes corrupt, a place where both national obsessions and naked greed are exposed. It's about the influence of big media, the fans and the hype they subsist on, the clash of ethics, the terrible physical demands of modern sports (from drugs to body size), the unreal salaries, the conflicts of race and class, and the consequences of sport converted into mass entertainment and athletes transformed into superstars--all presented in a way that puts the reader in the room and on the court, and The Breaks of the Game in a league of its own. David Halberstam (1934-2007) was the author of twenty-two books, including fifteen bestsellers. Born in New York City, Halberstam spent much of the 1960s as a reporter for The New York Times, covering the Vietnam War and the Civil Rights movement. His Vietnam reporting earned him both a George C. Polk Award and a 1964 Pulitzer Prize for International Reporting. Vanity Fair dubbed Halberstam "the Moses of American journalism," and the subjects of his books reflect his passion and range: war, foreign policy, history, and sports. The Best and the Brightest (1962), his sixth book, a critique of the Kennedy administration's Vietnam policy, became a #1 bestseller. His next book, The Powers that Be, a study of four American media companies, was hailed by The New York Times as a "prodigy of research." Many of Halberstam's books explored themes in professional sports, including bestsellers The Teammates, a portrait of the friendship between baseball players Ted Williams, Dominic DiMaggio, Johnny Pesky, and Bobby Doerr, and The Education of a Coach, a profile of New England Patriots' Coach Bill Belichick.